Offering you a complete choice of products which include actiglide stocking applicator, anti embolism stockings, leg ulcer hosiery stockings, lymphedema stockings, compression leg stocking and varicose veins stockings. Compression hosiery can sometimes be difficult to put on, particularly if you have limited mobility or hand movement. An ActiGlide is specifically for people who need that extra helping hand. ActiGlide allows your compression hosiery or arm sleeve to glide effortlessly up your limb. Suitable for closed, open toe and below knee or thigh length hosiery and tights. Ours' is a coveted organization that is engaged in distributing and supplying a vast range of Anti Embolism Stockings. We offer these stockings up to both knee and thigh levels. These stockings are used to reduce the incidence of DVT by more than 50% during long distance travel. Our products are highly demanded for their high reliability. For superficial and early varicose veins (enlargement of blood vessels). During pregnancy due to changes in hormonal secretion. Activa's leg ulcer hosiery kit is a hosiery alternative to bandages for healing leg ulcers. A 10 mm Hg liner followed by a British Standard Class 3 which slides over the top. 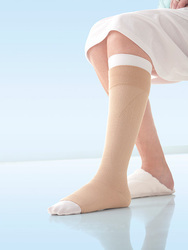 The combined compression allows leg ulcer healing without the bulk of bandages. Wound dressings may be worn under the Activa Leg Ulcer Hosiery Kit. Owing to the vast expertise gained by us over the years in understanding the needs of the clients, we are able to bring forth this range of Lymphedema Stockings. We procure these products from renowned manufacturers of the market who make use of quality raw material and intricate quality standards in production process. Since inception, we are engaged in catering to the variegated requirements of the customers by bringing forth exclusively designed Actilymph Compression Leg Stocking. Manufactured employing latest techniques and contemporary technologies, these stockings are developed under the guidance of adept professionals. For medium severity varicose veins or prevention of venous leg ulcers. Can also reduce the risk of DVT in higher risk groups during long distance travel. Comes in two different variant i.e., Activa British Hosiery or Actilymph European class. Available as sand color in five different sizes. Available as both knee level and thigh level. With the thorough knowledge of the varied aspects of the market, we have been able to provide the customers with Actilymph Arm Sleeves Stockings. Obtained from the credible vendors of the industry, these stockings are widely applauded in the market for their features like comfortable. Prior to dispatch, these stockings are closely tested on various characteristics to ensure durability. 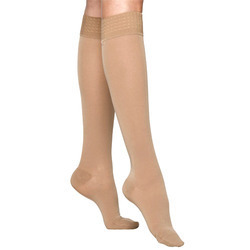 Looking for Compression Stockings ?